Back on Thursday, Cathy McMorris Rodgers released a statement in recognition of Tax Day. On April 15th, better known as ‘Tax Day,’ the American people reflect on the size of their tax burden and whether or not they’re receiving good value for their tax dollars. This year, with the federal budget at $3.8 trillion, the budget deficit at $1.3 trillion, and with a host of new taxes taking effect on account of the health care bill, we have more reason than ever to be concerned about the impact that tax and spending policies are having on our economy and our freedom. Are we receiving good value for our tax dollars? A question that cannot be answered in a general sense but can surely be asked in that manner. Throwing out big numbers, she hints of gloom and doom. The new taxes as a result of the health care reform primarily affect the wealthy and the biggest ones won't take affect until 2013 and 2018. So if things don't change by then, the wealthiest among us will be paying more. This year, the American people will pay more in taxes than they will spend on food, clothing and shelter combined. According to the Tax Foundation, the average American has to work for 137 days (or from January 1 to May 17) in order to pay their personal share of all federal government spending – either through taxes or borrowing. At best our congresswoman is being disingenuous. To hear her talk, you'd think this was only the result of the "tax and spending policies" of President Obama and the Majority in Congress. 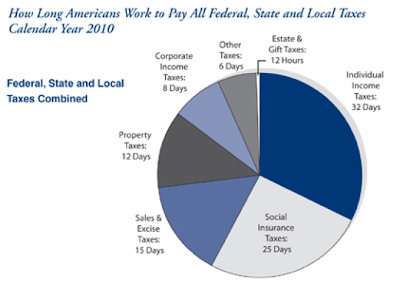 The Tax Foundation, from which our congresswoman got her data, includes federal, state and local taxes. Also, the May 17 date is a date to show the significance of the federal deficit. But when you consider all taxes, then it's easy to see that April 15 is the tax day for the people of Washington state. And even though we hear a certain percentage of people don't pay any taxes, that's false. Everybody pays. Furthermore, there is no relief in sight. Starting January 1, 2011 – and over the objection of House Republicans – American taxpayers will be hit with the largest tax increase in U.S. history when the 2001 and 2003 tax cuts are set to expire. She's referring to the Bush tax cuts, benefiting the wealthy for the most part, which are scheduled to expire as per the laws President Bush signed. These tax cuts, by the way, affected the deficit in a negative manner far more than spending increases did, according to the Congressional Budget Office. Last Friday I received a mailer from our congresswoman in which she decries the Health Care Reform bill that was passed. There's a laughable article on examiner.com about this. It basically repeats talking points. 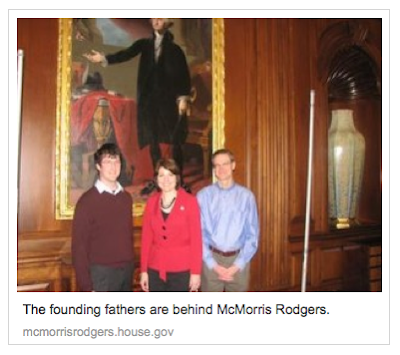 The best part if the picture that was lifted from McMorris Rodgers' web site. So is the man standing slightly behind her one of the founding fathers along with George Washington? Anyway, here's the flier mailed out to everyone in the 5th district. You'll notice that statement, "This mailing was prepared, published and mailed at taxpayer expense." That, too, is part of the good value for our tax dollars. The affluent generally work very hard for their income. McMorris Rodgers speaks for the majority of people in her district and is considered "safe" to be re-elected. The majority of Americans agree with the things she says because they know the current agenda is unsustainable. A VAT or National Sales Tax is a huge tax increase on all Americans. That affects everyone, not just the so called "rich". What defines "rich" anyway? I think it is safe to say that threshold will decrease significantly once we are given the truth about how we cannot afford the health care just forced on us. The current policies are bad for America and Americans. Thank goodness McMorris Rodgers is on the correct side of this issue. I certainly don't pay more in taxes than for food, shelter, and clothing... wtf? We'll say I pay $1000 a month for that kind of stuff, and maybe $300 in all taxes combined. Of course, that's only half of what my husband pays in child support for a child that the conservative county of Stevens will only let him visit for two WEEKS a year.